Situated at the northern end of the New Junction Canal at Went Ings, S. Yorkshire (Nat. Grid Ref. SE 6418/6518), in a rural landscape of lush lowland grazing marshes, species-rich hay-meadows, hedgerows and green lanes, the picturesque Sykehouse aqueduct, opened in 1907, was in 1998 deemed by British Waterways engineers to be in need of restoration. In advance of the major exercise of sand-blasting, re-priming and re-painting of this impressive piece of ironwork, Doncaster Museum was asked for information on bat sites which might be affected by the proposed maintenance work. Whilst examining the structure for bat signs during July and August 1998, the presence of numerous large orb-type spider webs, together with a conspicuous bespeckling of millions of spider droppings on the protruding metal lip around the base of the aqueduct structure, drew attention to a remarkable population of the uncommon riparian spider Larinioides sclopetarius (Clerck, 1757). The aqueduct is approximately 160 m long with three spans: a southern section of 16.2 m, crossing the southern soak drain of the river Went; a central 49.3 m section spanning the river Went itself; and a northern section of 15.8 m, crossing the Went's northern soak drain. The iron casing of the canal is constructed of sections 0.83 m wide by 3.30 m deep, each attached to a succession of protruding steel ribs. At intervals of approximately 2.5m, the casing is braced by a 1 m wide cradling structure. The overhanging parapet of the tow path, the protruding iron lip at the base of the aqueduct casing some 3.3 m below, and the iron ribs set 0.83 m apart and the paired steel girders of the cradling structures formed the outer framework and anchoring points for the series of huge orb webs. Females of Larinioides sclopetarius (Clerck, 1757) reach up to 14 mm in length and have a tendency to flatness of body reminiscent of the still flatter Nuctenea umbratica (Clerck, 1757). Jones (1983) and Roberts (1995) refer to its distinctly velvety appearance, the dark markings of the head, carapace and abdomen being attractively highlighted by clear white, rather angular, outlining. Jones (1983) and Roberts (1995) describe the species as very locally distributed throughout England and Wales and generally rather uncommon. In Watsonian Yorkshire, Smith (1982) describes it as uncommon, and there are currently only records from eight 10 km squares (SE 14, 42, 50, 61, 63, 64, 65, 71) mainly in lowland regions (Smith, 1982, 1985). Although Smith (1982) alludes to its presence on waterside bushes, this behaviour seems to be restricted to wandering adult males. Bristowe (1971) and Roberts (1995) refer to it being largely restricted to buildings, bridges and fences near water. This is certainly the case along the New Junction Canal and South Yorkshire Navigation where colonies are invariably below bank level on concrete or metal structures overhanging water. This assertion results from an examination of the habitat selection of orb web spiders along the New Junction Canal corridor undertaken in September 1998. It showed that Larinioides sclopetarius never occurred above bank or towpath level and, curiously, no specimens were located on the associated masonry buttressesâ€”spiders and webs were only found on the sections of the steel and ironwork over water. On riparian vegetation its place was generally taken by Tetragnatha extensa, on tall herbage by L. cornutus, and on waterside brambles and other shrubs by Araneus diadematus. It is tempting to suggest that the prevailing lowland distribution and the sub-bank preference of L. sclopetarius colonies may indicate that the species had a habitat niche in Britain on the undercut overhanging banks of rivers meandering across alluvial plains. Such situations are relatively rare in present-day highly engineered V-shaped river profiles, so the solid metal and concrete structures with overhangs and long drops to water beneath, associated with navigable rivers and canals, may form an ideal, if rare, artificial habitat substitute. On the evening of 30th July 1998, a butterfly net attached to a telescopic fishing rod, giving a reach of about 5 m, was used to collect specimens from the nearest (south eastern) sections of the aqueduct's central span. With one sweep, 24 adult females and a single male were secured, and then transferred to suitable sections of the metal footbridge over the canal and to metal bank piling at the southern approaches to the aqueduct. This was a timely exercise because, by September, the aqueduct metalwork had been sand-blasted, primed and repainted and no spiders remained. A few days later, on 2nd August, by lying on the towpath parapet and looking down at the aqueduct structure through 8 x 40 binoculars, it was possible to undertake a section by section count of occupied webs. Two hundred and thirty-three adults and large sub-adults were counted which, with the 25 spiders removed on 30th July, gave a total of 258â€”by far the largest population in Yorkshire. Only two were males: this low proportion may be due to mortality late in the breeding season. Although the population was distributed along both the east and the west facing aspects of the three aqueduct spans, most (74.8 per cent) were on the eastern (downwind and downstream) side, with the largest concentration (39.9 per cent) located in the southeastern section of the central span (see Fig.l). Perhaps the eastern side was more sheltered from the prevailing southwesterly airflow and was more conducive to flying insects. The spiders occupying webs on the western aspect, though receiving sunlight for longer into the afternoon and evening, may be more vulnerable to predation by birds. Although the translocation was beneficial in enabling some adult, perhaps fertilised and gravid, females to survive, the exercise at this time of year was perhaps a token gesture. In warm, fine conditions on 2nd August, hundreds of spiderlings, which had emerged from cocoons secured beneath the parapet overhang, climbed onto the sunlit and windswept parapet, produced strands of silk and 'ballooned' into the brisk southerly breeze. Although no suitable habitat was visible downwind of the aqueduct, a proportion of these aeronauts could possibly have been dispersed to sites at Southfield Reservoir and along the Aire/Calder Navigation some 500 m to the north. The rather bedraggled, often huge (up to 2.7 m2), orb webs frequently linked up with adjacent webs and, although the spiders were well separated, they readily moved from web to web when disturbed without obviously exhibiting aggressive behaviour to their neighbours. The section by section count mentioned above revealed that, although each 0.83 x 3.3 m aqueduct section was often occupied by only one spider, up to 14 adult and subadult specimens could actually be accommodated (see Fig. 2), apparently without exhibiting aggressive behaviour towards each other. Significantly, while being transported in the confines of the butterfly net, the 25 spiders did not seem either to avoid or attack each other, a phenomenon rare in web-spinning spiders which I have only previously encountered in Steatoda bipunctata. I thank Mr Tony Brian for the use of the extendible fishing rod, and Mr Bill Richardson, British Waterways security guard, for assistance during the nocturnal parts of the survey. Bristowe, W. S. (1971) The World of Spiders. Collins, London. Jones, D. (1983). 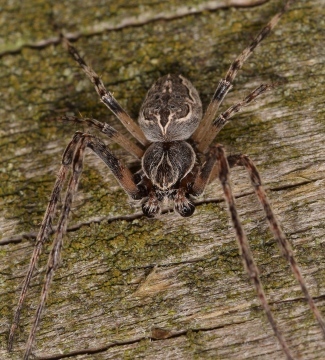 The Country Life Guide to Spiders of Britain and Northern Europe. Hamlyn, Feltham. Roberts, M. J. (1995) Spiders of Britain and Northern Europe. HarperCollins, London. Smith, C. J. (1982) An Atlas of Yorkshire Spiders. Privately published, York. Smith, C. J. (1985) Additions to 'An Atlas of Yorkshire Spiders'. Privately circulated.